Each family, I think, has its own defining movie. The movie that just "clicks." The watch again and again kind of movie. The movie that's quoted ad nauseum and never fails to bring a laugh. For my family, it was The Caddy. Dean Martin and Jerry Lewis, 1953. 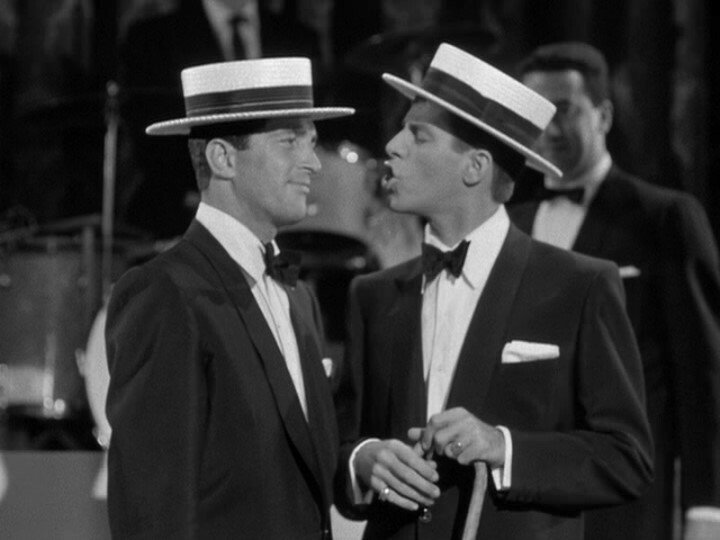 Normally I'm not a big fan of Martin and Lewis, but this comedy has it all... wit, plot, drama, romance, music, charm, and great one-liners. I watched it last night with my husband, and instantly I was transported back to my happy youth. All of the lines came back to me and I was quoting it again with fervor and feeling. It's not widely available at local rentals or libraries, but you can get it on Netflix. What are your family's favorite films? Oh we have lots of them. I love The Labyrinth and The Sound of Music. When I was little we had theme weeks and would watch a movie every night related to that theme. It was a great way to spend enjoy a hot summer evening. Alfred Hitchcock was a favorite for those weeks. We also did Shirley Temple, foreign films, musicals, etc. Ours are too numerous to mention, but we have the first 3 seasons of Green Acres on DVD and have watched them so many times that we know every episode by heart. "Behind every good man, there is a good woman standing in front of him." That is a GREAT movie. Glad it took you back to your youth. I still love "The Music Man" with Robert Preston. W.C.C.